(NR 9935 2075) Cairn (NR). This Clyde group, long cairn has been robbed and only 2-3ft of turf-covered cairn material remains. Oriented E-W, it is about 100ft long, but the edge at the E end is difficult to trace as the cairn material merges with rock outcrop, and is overgrown with gorse; it might extend to 112ft. The long sides of the cairn are defined intermittently by a kerb of orthostats and dry-walling; the cairn material extends up to 7ft outside the kerb, the stones of which hardly show above the present level of the cairn. 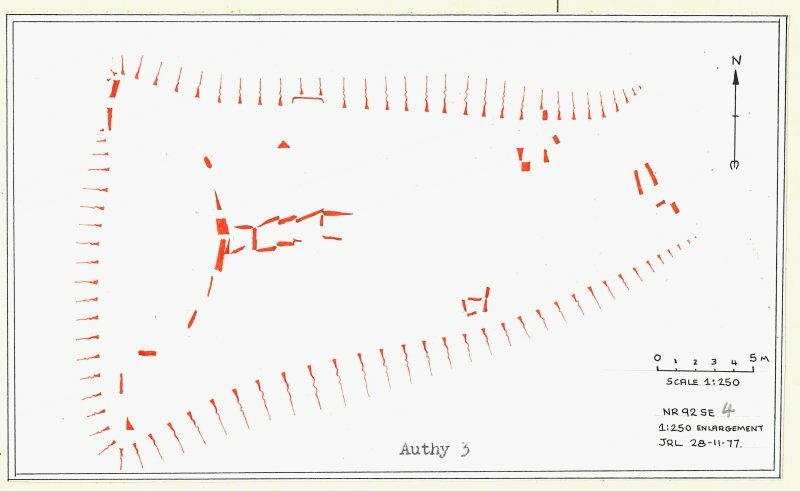 The original width of the W end, where the square ended horns and semi-circular forecourt are defined by a number of orthostats was about 65ft while the E end was 22 ft wide. The chamber, which was cleared out by Bryce (1909) is 22ft long by 3ft - 3ft 6ins wide, and divided into 5 compartments. There appears to have been a lateral chamber, 12ft long, at the E end of the cairn, entered from the S.
The main chamber is known to have been cleared out many years before Bryce's excavations. He found that the compartments were filled with earth and stones. On the floor of each (or of the first two (a)) was a layer of black earth, with numerous fragments of charcoal (b). He found a pitchstone flake, and a fragment of a round-bottomed bowl-like vessel. These items are now lost. The cairn, occupying an outcrop above Struey water, is as described above. Its remaining mound 21.0m wide at the W end and 1.2m high on the S side, is largely turf covered and overgrown with gorse, making the precise line and composition of the kerb on the N and S sides difficult to interpret. Two probable lateral chambers, not mentioned above, are exposed near the N and S edges of the cairn, E of centre and approximately 7.0m apart. Their remaining stones suggest 1.0m square compartments. East Bennan is the classic example of the trapezoidal and homed long cairn of Clyde-type. It measures about 34m from east to west by 6.7m at the narrow east end and 19.8m at the wider west end, but it has been extensively robbed of stone and only stands to a height of 0.9m. The sides of the mound were revetted by a kerb of boulders, a few of which are still visible. At the west end there is a semicircular forecourt, flanked by square-ended horns, and the remains of an orthostatic (upright stones) facade. At the centre of the facade the two tallest stones act as portals on either side of the entrance to the chamber. However, as they are only 0.15m apart at ground level, it is difficult to see how this gap functioned as an entrance; it is possible that they are a late addition to the cairn and were inserted during the ritual blocking of the cairn once burials had ceased (cf Monamore, no. 101). The portal stones appear to be deeply buried, and this probably indicates that the forecourt is packed with a considerable depth of blocking material. 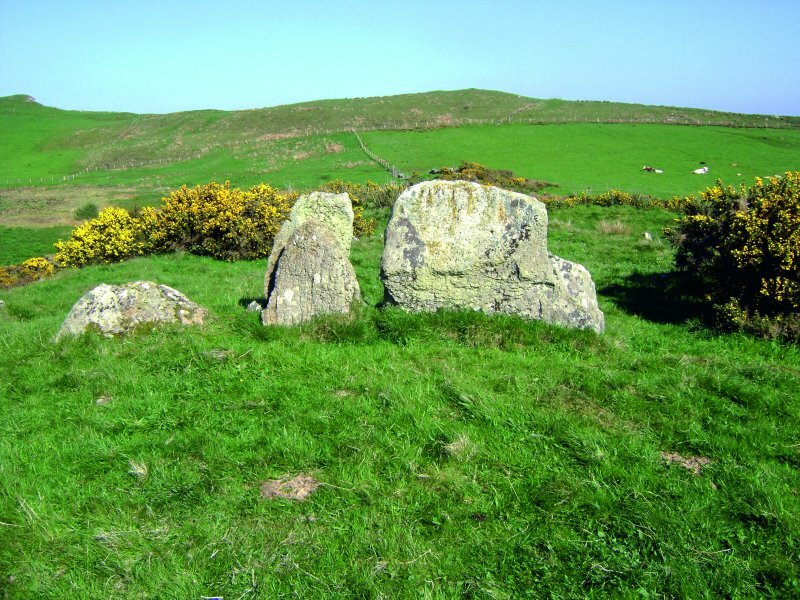 The chamber is one of the longest in the Arran neolithic cairns and consists of five overlapping pairs of stones, making five compartments which are divided by septal slabs. Like so many of the Arran chambered cairns, the chamber was excavated by T H Bryce (in 1909), but it had been cleared out before Bryce's day and all he found was a flake of Arran pitchstone and fragments of a round based pot. At the east end of the cairn there are at least two lateral chambers set at right angles to the long axis of the mound; their relationship to the cairn is uncertain and excavation would be required to tell whether they are part of an earlier cairn incorporated into the later long cairn or secondary chambers inserted after the construction of the primary west chamber.